Project portfolios are helpful for grouping work and managing projects individually and as a whole. Many companies start out not utilizing project portfolios. Then, as the company grows projects become unmanageable and the need for project portfolio management becomes clearer. Portfolio management helps companies maintain efficiency and breaks project work load into manageable pieces. It is vital that whatever project management software you utilize, be sure it is scalable to include project portfolios. It is likely you will need it! There is way too much to cover in this short blog. However, a pretty good white paper can be found from Mosaic Project Services at the link below. Task Status: In Microsoft Project, the task status field represents the current state of each task. The illustration below shows all the possible task states: Future Task, Late, On Schedule, and Complete. How do tasks get into these states? 1. Future Task: When the task ‘Start’ date is in the future. 2. Late: When the completed hours are less than what they should be by today. 3. 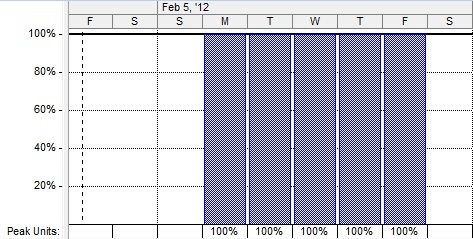 On Schedule: When the completed hours are >= to what they should be today. 4. Complete: When the percent complete is 100%. One of the more recognized terms in any business is Paralysis by Analysis…or Analysis Paralysis. You know, when nothing moves forward because too many people have to buy off on an idea, or a single person is the team lead and afraid to jump in with both feet. Well, I believe one way to identify Analysis Paralysis is to look for the most common symptom…pathological cases/scenarios. This is easy to spot. When “what ifs”, that are highly unlikely continue to pop up, then you can get stuck in the “what if” cycle, causing Paralysis by Analysis. These pathological cases have a sliver of possibility but cause an overwhelming fear for the project team. Then you’re off trying to plan or prevent the impossible. I have seen this happen many times and more often than you may think. Project leaders and team members can easily become myopic when focusing on their work. In my experience the best way to tackle pathological cases is head on. Politics is one thing, but a never ending project is another. I understand the latest fad in management styles is the collaborative process. Part of the collaborative process is encouraging multiple people to arrive at a decision as a unit, or on behalf of the unit – where, in times past, there was a “buck stops here” person. Now there is a buck stops here, over there and just about anywhere group of people. While the collaborative process has a place and is effective in many scenarios, it is dangerous when it bleeds over into a non-collaborative project structure. I’m not saying project teams shouldn’t work together to collaborate and solve issues. In fact, just the opposite! Project teams are a TEAM by definition, working together towards a common goal. However, with a younger generation being taught the collaborative process so heavily, it can cause issues when they veer out of their lane and bypass a structural hierarchy or chain of command. The collaborative process is great until a person makes a decision without actually collaborating with the person/persons responsible for that particular area of concern. By the time the “true decision maker” finds out, the decision has been made, announced and partially implemented. Now we have a real mess. Collaborate on that! I’ve recently been made aware of another method of resource allocation. I’ll throw it out here to see what project managers think. It’s a simpler method than the traditional task-based resource allocation. Before getting into that, I’ll briefly describe the resource allocation method I am most familiar with. In this method, resources are assigned to project tasks that have clearly defined durations and remaining hours. The tasks may also have starting and finish dates. The resource allocation algorithm spreads the remaining task hours over the date range defined by the task. If you have too many tasks, you are over-allocated. Too few, and you are under-allocated. The simpler method I became aware of doesn’t use tasks. It also doesn’t use start and finish dates. Projects are assumed to continue forever, and resources are assigned a percentage of their daily scheduled hours. That’s it, nothing else. In the simpler method, resources are over-allocated when they are assigned to so many projects that their daily hours are exhausted. They are under-allocated when there are still a few hours left in their day. Timephased: Total project task hours distributed over a period of time. An example from Microsoft Project of this is shown below. The hours for each project task are distributed over the duration of each task. The hours per day is the ‘Work’ field divided by ‘Duration’ field. In other words, the total work is spread evenly over the duration. Choose the Microsoft Project views below to see these task layouts. You can see that the 100 hours are timephased over 10 days for the first task, and over 1 day on the second task. For our company, great features rarely come from high-octane project brainstorming sessions where the heavens open to reveal the glory of God. Instead, they come from lowly customers here on earth. “That’s none of your business!” cries an eavesdropping passerby. Nine times out of ten that question turns into a great new feature. We discuss the business case and work out an alteration that fits the common usage much better. Customer is happy; we’re happy. Now we just need to sell it to the executive management and development team. Why is this exchange so valuable? Because it comes from an actual customer with little vested interest in the product. They just want it to work better so they can get their work done faster. That’s the key. Anytime you can reduce admin time or improve product usage, everyone wins. Nobody likes a hard product. Dreaming up great new features in a boardroom rarely accomplishes those basic goals. Talking to customers is where it comes from. Problem is, who’s talking to customers? Tech support, sales, and maybe a marketing hopeful willing to mingle with the great unwashed. These are the lowlife employees nobody listens to. So how does the customer need get filtered up the channel to executives and then back down to the development team? Give them a database. Let them submit feedback from the trenches. If they can articulate the business need clearly and effectively, people will listen. The best features always come from customers. Assigning a project resource to a task by percentage alleviates the problem of overallocation. Below are two project tasks assigned to the same time period. If they both must be completed, you have an over-allocation problem. Over-allocation simply means that the person has been assigned too much work to perform in a given time period. In all likelihood, they will not be able to complete the work. Choose View, Resource Graph in MS Project to see the problem Red bars mean the resource is overallocated for that time period. In this case, there is double the work that is reasonably expected from the project team member. So how do you fix that? Here’s how to solve it: Assign the resource to work only 50% of their hours on each task. Assigning project team members a certain percentage of their hours reflects the likely situation on the ground. Hald their time goes to one task and half to the other. Let the resource figure out when to actually perform the work. This is the new resulting project resource allocation graph. It shows that the resource is fully allocated to 100%. I remember my first software development job in 1992. I joined a software company that developed for the “new” Windows operating system: Windows 3.0. As a junior member of the team, I was deathly afraid of revealing what I didn’t know and lose my coveted new job. I was sure everyone on the team knew more than I. So worked 72 hour weeks to catch up. I studied, and coded, and watched, and listened, and tried to fit in as best I could. It worked perfectly! But it turned out I wasn’t the only newbie, and I learned that I knew more than I thought.